The question of intuition as a form of mistaken perceptions is not new to cognitive psychology. The subject is of value for discussions of the role of judgment in people in professions in business, science, medicine, and law, or even politics, alike. Intuition as a form of cognitive bias may be our downfall, but it may also be utilized to our advantage and as such an instrument of incomparable value. In order to understand just how cognition and affect combined play a role in the formation of intuitive judgments, take the example of ancient Roman architecture. Ancient Roman High Imperial art under Trajan and Hadrian is known for its increasing subjective qualities. Arguably, with its technical expertise and refinement, Roman art reached its peak at this time. 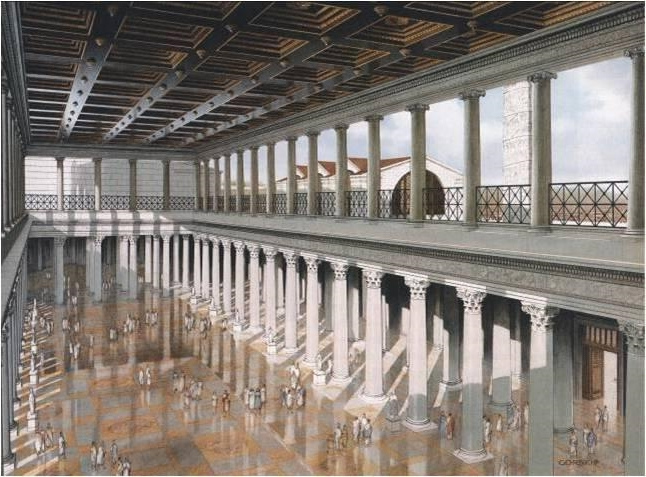 In particular, ancient High Imperial Roman architecture is resplendent, grandiose, and impressive. It reveals the extraordinary sophistication of that civilization as well as the immensity of its power. 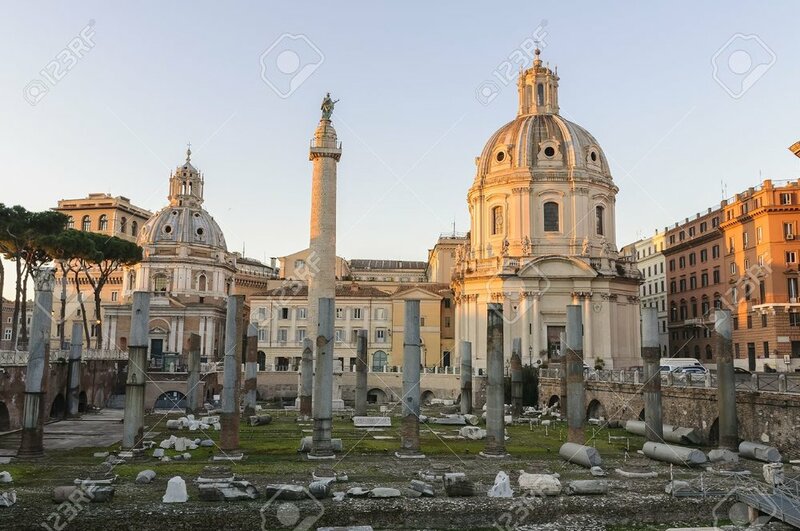 The Basilica Ulpia in Trajan’s Forum is one such example. Today only the columns are left standing. The building was used for judicial, banking, and administrative purposes. In this vast space, the Romans gathered together to execute transactions of Roman bureaucratic and administrative law. This reconstruction drawing is very useful. Notice the exaggeration of its scale and size. The illustrator has explicitly made clear that for which the space is intended. Margaret Iverson points out an illuminating insight in Alois Riegl: Art History and Theory. The Greeks designed the Parthenon, their temple on the Acropolis in Athens, according to rules of measurement and proportion pleasing to the accepted values of universal rightness. The Romans took the design of the Parthenon but not the same aesthetic principle. When we look at the columns that recede into depth, the emphasis is less on verifiable measurement and the justness of proportion than the illusion of vastness into infinity and expansive space. In several studies Daniel Kahneman has explored this very sort of intuitive reasoning, here exemplified by a habit in perception. He claims that judgments made according to a “heuristic” model tend to exaggerate and overvalue the probability of things. This is to say when perception offers us an experience of reality that outweighs subjectivity over objectivity, illusory rather than tangible, we tend to exaggerate the importance of things. Yet, the Roman legal and bureaucratic system was a formidable tool of logic and reason to administer and control an immensely vast empire. Western Civilization would not be what it is today. In fact, much of Roman law still even stands with us. The exercise of reason, whether that be in law, the management of business risk, science, or medicine, is a process of creating a coherent and accurate pictures of things. Kahneman explains how in perception, we master our subjective experiences by applying objective criteria derived from reality no differently than when we form preferences and beliefs. However, we are at a loss when objective measurements are unavailable. Consequently, we are left with making the most significant choices under intuitive evaluations. The psychologist JJ Gibson argued for a theory of “affordances” in human perception to explain how humans seek coherency and accuracy. Just as when an artist resolves invariant information in a coherent work of art, so too is perception itself an act of judgment of invariants for anyone. An artwork always begins with an uncertainty, something like a question that poses the possibility of irresolve. An artist finds clarity working between objectivity and subjectivity. Gibsons ideas about perception are very much based on bottom up theories of perception versus the top down theories, which argue for the importance of unconscious inference following the ideas of Herman Helmholz. Ecological optics explains how the ambient optic array is taken in by the eye, processed, interpreted, and resolved. He recognized how the invariant information available to the eye form “optical flow patterns.” Through direct perception we interpret these invariant structures without actually needing to rely upon any form of computational logic. In drawing comparisons between cognitive psychology and perception, Kahneman ends his study with Amos Tversky claiming human judgment must “reflect the tension between compelling logical rules and seductive nonextensional intuitions.” The seat of judgment in perception proves to be intuitive in the first instance only to be verified by the way ultimately humans rely upon tacit awareness. In fact, Gibson even referred to this kind of expertise as a niche, no different than how an animal learns to survive in its habitat.